It’s been quite the month here at XP, as today we launched a news site dedicated to the stadium industry… we call it TheStadiumBusiness News. Through our meetings and events, we’ve been helping stadium businesses for the past decade. We thought we should share some of the key news we receive everyday – and have hired a small team of expert writers to cover the sector. It’s really exciting to be continuing to develop the TSB brand and this additional channel will enable us reach an even wider audience across the industry. 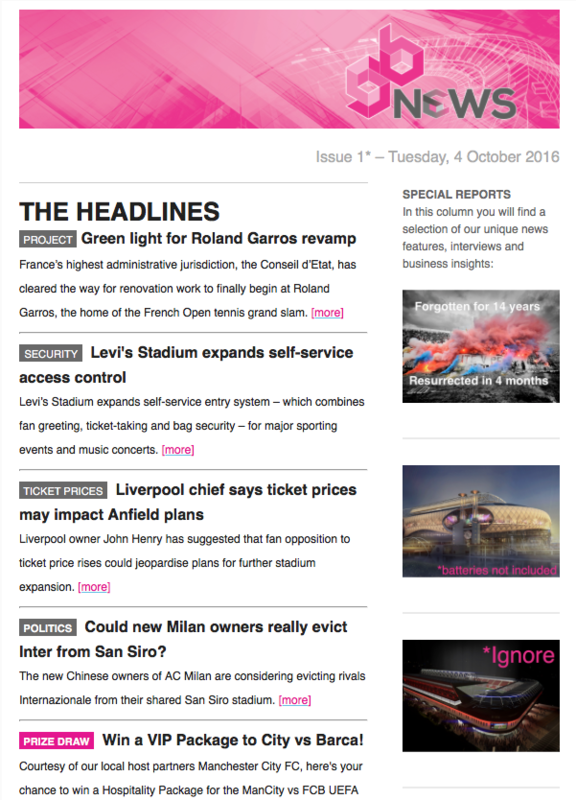 With two of the stadium industry’s most respected meetings, two prestigious awards events and now a dedicated news channel we’ve got the stadium business covered. Join us! If you have a great stadium, arena or sports business news feed, blog, podcast or video channel that you’d like us to include in The Stadium Business – or if you have any suggestions of new topics that you’d like us to report on – then please email us with your ideas!